A new plan is on to develop Dharavi, Asia’s largest slum, but its residents are sceptical. SELVARAJ THEVAR has been waiting for 20 years for the construction of a housing complex in Dharavi that would include his flat. For the past 10 years, he has roughed it out in a transit camp waiting for his house to come up. Now, the construction is almost complete. "Our society has been through every housing scheme that the government has announced," says Selvaraj. "First, it was Rajiv Gandhi’s Prime Minister’s Grant Project (PMGP). Then, it was the Slum Redevelopment Scheme (SRS). After that, it was the Shiv Sena’s Shivshahi Punarvasan Prakalp (SPP). But there was always some problem either with the government or the builder. Now, an NGO (non-governmental organisation) has promised to complete construction." Dharavi, considered Asia’s largest slum, has seen many redevelopment schemes come and go. But this large settlement in north-central Mumbai is yet to see any results. Few buildings have come up. Some have been left incomplete. Now, the State government has approved yet another grandiose plan to `redevelop’ Dharavi - considered an eyesore by the city’s elite planners. What started out as a small community on marshy land near the Mahim creek has turned into Dharavi, a well-settled colony housing a cosmopolitan population. 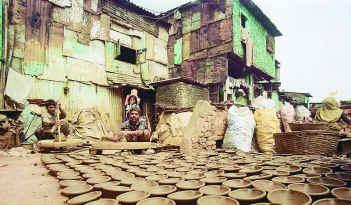 Policemen and potters, migrants and small businessmen - all live in this amalgam of enterprise. As the settlement grew, it attracted the attention of city planners, mainly because of the lack of infrastructure here. Over the years, infrastructure has improved slightly. Larger roads and drains have been built. Yet, a lot needs to be done. The sheer resourcefulness of its residents has made Dharavi one of Mumbai’s more prosperous slum colonies. It has large leather, garment and plastic industries. Its leather units also export goods. Individual businessmen and residents have improved their establishments. 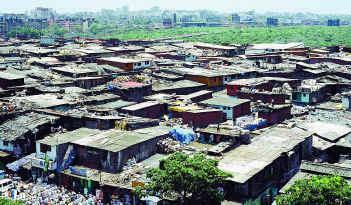 Dharavi has the highest population density in Mumbai, which is considered a congested city. Over the years, it has also become a prime location situated centrally - near the highway and close to the new commercial Bandra-Kurla complex. Again, it has caught the fancy of the builders’ lobby. In fact, the government plan for Dharavi has been formulated by an NRI real estate developer, Mukesh Mehta. Under the new Rs.5,600-crore plan, Dharavi’s 174 hectares will be divided into 10 zones, which will be developed by one builder. It will include residential, commercial and industrial areas. The builder will also have to construct schools, hospitals, gardens and playgrounds. To cross-subsidise the project, the developer gets a portion of the land for commercial development. "A few years ago, Mukesh Mehta held meetings here and told us that he would make Dharavi like America," said Teni Ramchandran, a resident. Now, the government has adopted Mukesh Mehta’s plan. It has increased floor space index (FSI) rules only for the Dharavi redevelopment project. This will allow for high-rise construction, especially in the commercial areas. Dharavi is also a thriving industrial area with several small businesses, industries and home-based units. 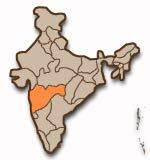 "The local economy generates around Rs.1,500-2,000 crores every year. It has around 5,000 small-scale industries - plastic recycling, garments, printing presses, zari making, pottery and leather. These businesses will be given plots. Moreover, the government has also planned to build special economic zones and vocational training centres," said Subhash Dalvi, officer on special duty for the Dharavi project. Many residents are sceptical about the new plan. "What arrangements have they made for our factories and godowns? Some people have large warehouses here. What guarantee is there that they will get a plot of the same area? What about the people who work from home, making papads?" asks S. Ravindran, owner of a small shop. "This is a top-down plan made without taking residents into confidence," says A. Jockin, of the Society for Promotion of Area Resource Centre (SPARC). "The government has made the plan in air-conditioned offices. The builder will carry it out. People have to just fit in. Earlier, people had a choice whether they wanted to opt for the SRS. With this new plan, they won’t have an option." The plan will implement the government’s SRS on a mass scale - a scheme that has already been called a scam by the government-appointed S.S. Tinaikar Committee (Frontline, October 12, 2001). According to the Committee report, Public land in Mumbai’s prime areas was handed over to builders for a pittance; rules were violated while arranging loans for developers; builders abandoned construction mid-way without completing them; and some projects did not even take off after getting commencement certificates. 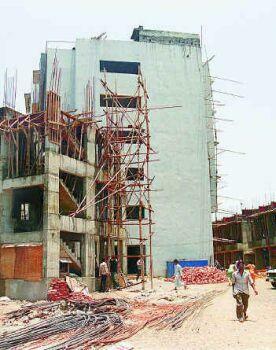 Tinaikar said in his report that schemes relying on builders to construct houses for slum dwellers are doomed to fail. "The size of the problem," his report said, "is of a magnitude with reference to which the achievement over the last 10 years of the slum rehabilitation scheme is so minuscule; the gains derived by some developers by grabbing premium plots of public authorities for a song, are so high; and excessively liberal development control rules to `facilitate’ the developers to make unlimited profit at the cost of integrated development of (this) metro city so brazen; that the continuation of this policy... is bound to be disastrous." Yet, this scheme is being applied for all of Dharavi. Another large question is whether Dharavi’s infrastructure can take the additional load. Former Prime Minister A.B. Vajpayee visited Mumbai during the election campaign and promised Rs.500 crores for infrastructure development. But the newly elected local MP says that the money has not come from the Central government. Also, the slum has developed over marshy land. "The geography of the area is such that it is virtually impossible to construct proper infrastructure," says Tinaikar. The task of relocation of more than 6 lakh residents may also prove impossible. "Where is the place to build transit camps?" asks Jockin. "In the process of redevelopment, you will create more slums." Owners of large godowns and industries are likely to resist the move. Some industries are polluting, which the government plans to shift. They will also put up a fight. Many Dharavi residents also manage to build houses larger than the 225 sq. ft. rooms that they get under the SRS. The government may keep building castles in the air, but Dharavi’s residents have their feet firmly planted on terra firma. Like Selvaraj, they know better than to trust one more promise to transform their lives. They prefer to take things in their own hands and do it themselves. "Instead of giving land to builders, why doesn’t the government give it to people instead? Then they can develop it the way they want to. And the profit can go to people rather than builders," said a resident. Pic 1: SHASHI ASHIWAL ; A bird’s eye view of Dharavi. This sprawling but well-settled colony is being eyed by construction firms because of its proximity to the highway and the newly developed Bandra-Kurla commercial complex, where offices of large corporations are located. Pic 2: The livelihood of the potters of Kumbharwada in Dharavi will be under threat if the State government plans to redevelop the area. Pic 3: Partially constructed buildings in Dharavi. Many builders have abandoned slum redevelopment schemes mid-way.